A Florida doctor who travelled to Canada after being exposed to MERS has tested negative for the virus, a Health Canada official has confirmed to CTV News. The doctor’s exact location was not revealed, but officials said he had isolated himself in his hotel room until he could be cleared. Geo Morales, a spokesperson for Orlando Health, told CTV News earlier on Wednesday that the doctor came to Canada by plane. The doctor travelled to Canada before learning that he had been exposed to a MERS patient in Florida who had recently travelled to Saudi Arabia. He has not exhibited any symptoms of the illness. Meanwhile, about 20 Florida hospital workers who came in contact with the patient are currently being monitored for MERS symptoms, which include a flu-like fever and cough that can potentially lead to shortness of breath, pneumonia and death. Tests done of two health-care workers who exhibited flu-like symptoms came back negative, Florida officials said Wednesday afternoon. Most preliminary tests done on the other health care workers also came back negative, they said, stressing that the infection has been contained and there is no risk to the public. On Wednesday, the World Health Organization decided against declaring the evolving MERS outbreak in the Middle East a global health emergency. WHO spokesman Dr. Keiji Fukuda said there's no convincing evidence to conclude that MERS has become more transmissible from person to person. University of Calgary infectious disease specialist Glen Armstrong said while MERS is concerning, it’s not particularly contagious. "It only really spreads if you've come into very close contact with an individual that is showing signs of sickness with the virus," he told CTV News Channel on Wednesday. A total of 152 people have now died and 495 have been confirmed to have contracted the virus in Saudi Arabia since it was discovered in 2012. Armstrong said while the mortality rate is quite high, MERS tends to cause very serious illness or death in individuals with underlying medical conditions. He said MERS cannot be treated with antiviral drugs and there's no vaccine for the illness. Some experts say the spread of MERS is similar to the 2003 global outbreak of Severe Acute Respiratory Syndrome, or SARS, which infected about 8,000 people, killing nearly 800 worldwide including 44 in Canada. Two MERS cases have been confirmed in the U.S. and Armstrong said he expects the virus to spread to Canada. "It's probably only a matter of time before it does show up in travellers coming back from the Middle East to Canada," he said. However, global disease specialist Dr. Kamran Khan said the transmission of the MERS virus is more of a concern to the medical and public health community and less of a concern to the general public. Khan said that while the doctor who travelled to Canada was exposed to the virus, chances are low that the physician is infected. "At this point in time there are no symptoms or signs (of MERS), there's a very good chance nothing will happen," the Toronto-based doctor said. Khan said while SARS caught medical experts off guard, much has changed over the last decade and hospitals are better prepared for outbreaks. He said plenty of correspondence about MERS signs and symptoms is already circulating at the Toronto hospital where he works. "We're really kind of just waiting for this virus to arrive and essentially jump on it with the appropriate infection control precautions," Khan said. Former Chief Medical Officer of Ontario, Dr. Richard Schabas, said he agrees with the WHO’s decision to not declare MERS a global health emergency. “Obviously there’s still some unanswered questions; the fact of the matter is that it really doesn’t pose a serious risk beyond a very limited area in Saudi Arabia and a couple of contiguous countries,” Schabas told CTV News Channel. Schabas, who was at the forefront of the SARS crisis in 2003, said there are similarities between the two viruses, especially since both SARS and MERS are coronaviruses. However, Schabas said that while SARS appeared to be a one-off, MERS seems to be “a steady stream of exposures,” probably from camels in the Saudi area. 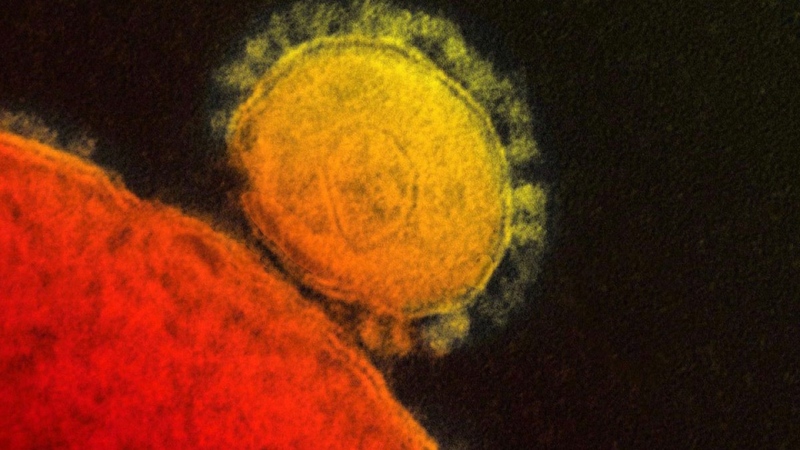 This file photo provided by the National Institute for Allergy and Infectious Diseases shows a colorized transmission of the MERS coronavirus that emerged in 2012.